Steven Spurrier was in town this week for ongoing Singapore Airlines wine selection tastings (he’s been doing it for 22 years! ), along with panel colleagues Michael Hill-Smith MW and Jeannie Cho-Lee MW. As it turned out, it was the perfect opportunity to raise a glass to Spurrier’s innings, 70 not out. Spurrier was in good form and looks nothing like 70, as he quipped when someone asked if there were going to be more parties, which came out the wrong way, as in meaning other 70th celebrations, he replied, “I’m hoping a least another 10 and 80 is a good number”! Spurrier’s wine career spans some 47 years, entering the wine trade in 1964, his formative years spent as a trainee at London’s oldest wine merchant, Christopher & Co. He moved to Paris in 1970 starting his wine store in 1971, in rue Royale, called Les Caves de la Madeleine, all rather odd for an Englishman from gentry. He told us his parents despised his foray into the wine fraternity, his father berating and disowning him for years, “Wine is trading, and we don’t trade, it’s for other people to trade”. Some years later, his parents were travelling with him and someone approached them to say, “Oh, you’re the famous wine merchant”, and it suddenly clicked to Spurrier’s father that he might be doing something noble, to the manor born. I relate to him more as the founder of L’Academie du Vin, which in my time as a fledging sommelier was the benchmark of wine education and I cut my vinous teeth on their course manuals. It’s hard to sum up a career as influential as Spurrier’s and not really my intention for this column, but one has to mention his importance on the world wine stage in many facets, most visibly as the architect or instigator of the “Judgement of Paris”, a now famous tasting held in 1976, pitching chardonnay and cabernet from California against the realms of Burgundy and Bordeaux. However, a must-read is “The Judgment of Paris, California vs France and the Historic 1976 Paris Tasting that Revolutionized Wine” by George M Taber (Scribner). Taber was the only reporter present at the tasting, and then the Paris correspondent for Time magazine, brings this event to life brilliantly. It was inevitable that Bottle Shock would come up in our dinner conversation and Spurrier seemed quite at ease about the whole thing, having confessed to watching it for the first time only recently. He was in top humour telling us about the initial contact made by actor Alan Rickman, who portrayed Spurrier in the film, and the general feel of the film. And despite all the films inventions and inaccuracies, he has interpreted it as light comedy and thinks no more of it. I personally thought Bottle Shock was a bit weak, moreover a lost opportunity to tell a really important story in wine history. Although I did enjoy some of the humour, particularly the relationship between Maurice (Dennis Farina), a wine lover from Milwaukee, Spurrier’s (Alan Rickman) most regular customer and confider with some humorous conversations that does put a perspective on the series of events and how off the wall Spurrier’s real life experiences in Parisien society were. Spurrier returned to England in 1988, subsequently becoming a wine consultant and journalist, and is now director of The Christie’s Wine Course, which he founded in 1982. Many wine consumers will identify with him as the consultant editor to Decanter wine magazine with his regular column and involvement in the Decanter wine awards. 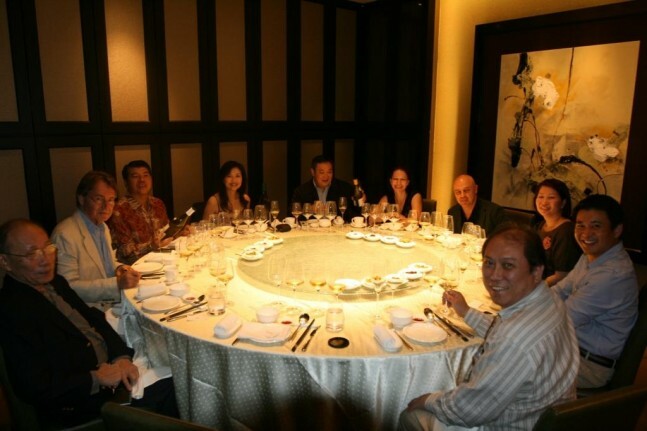 Back to our dinner, we convened at the Imperial Treasure Super Peking Duck at Paragon, which is one of Singapore best Chinese restaurants and has to be the best duck in town. 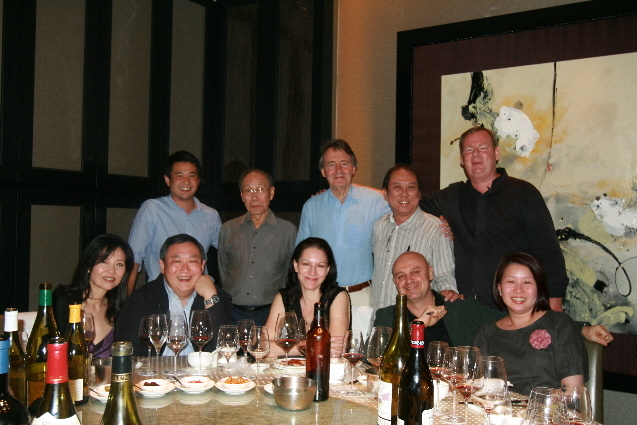 Hill-Smith had gathered a great group of people including octogenarian and legendary wine collector, Dr NK Yong, the indefatigable wine writer and presenter, CH’NG Poh Tiong, the venerable Sheriff of the Singapore wine retail industry, Don Tay, Ignatius Chan and Janice Wong of the eponymous Iggy’s restaurant, wine distribution commando, Michael Chong, from Monopole, our estimable Singapore-based Master of Wine, Lisa Perrotti-Brown, along with her Jedi colleagues, Jeannie Cho-Lee MW and Michael Hill-Smith MW, and of course, the notorious Wandering Palate. We were ask by Hill-Smith to bring a worthy bottle, as you could imagine, collectively an amazing, if not eclectic, line-up and one of those wine experiences that you will never forget. We opened with 1988 Krug, drinking superbly with wonderful scents of mushroom and caramel-nougat nuances, incredibly ethereal and amazing it is vitality and vivaciousness for a 23 year-old Champagne. 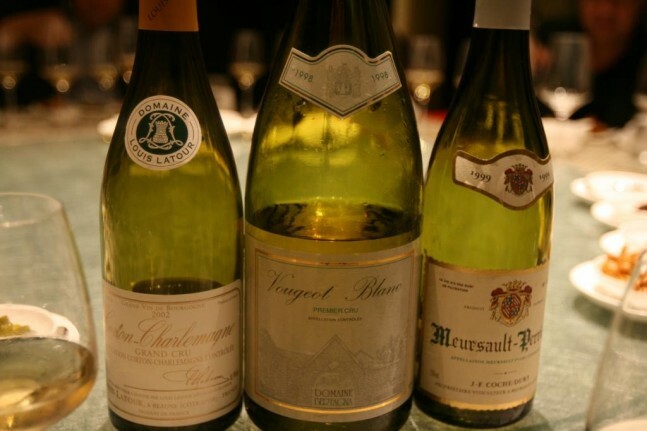 A bracket of 3 white burgundies opened the batting at the table, a 2002 Louis Latour Corton Charlemagne rich and smooth, possibly to smooth and lacking concentration. Personally, Louis Latour has never done it for me, I think just too commercial in their approach. A Vougeot Blanc 1998 from Domaine Bertagna found favour, quite exciting, fragrant and tantalizing wine. However, a 1999 J.F. Coche Dury Meursault Perrier reigned supreme looking great, grubby and powerful, an awesome wine with plenty of time in it – Coche-Dury unquestionably the king of white Burgundy. 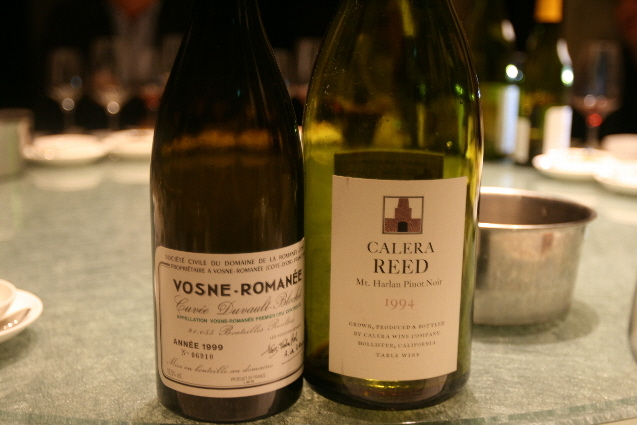 Next bracket was a pair of pinot noirs, an antipodean example – as in opposites – of this mighty grape; a 1999 DRC Vosne-Romanée 1er Cru Cuvée Duvault-Blochet and a magnum of 1994 Calera Reed Vineyard Pinot Noir, Mount Harlan, Californian. Unfortunately the DRC was not a good bottle, with some debate on if it was corked (Hill-Smith, Cho-Lee and I in the corked camp), but even Spurrier, who brought the wine along, admitted in the end it was not the wine he remembered from his last experience of it. A single bottle of 1941 Yalumba Galway Claret, Barossa Valley, Australia deserved individual attention, Spurrier’s birth year and obviously a fascinating window of wine history. The wine came direct from the private cellars of Yalumba, no better guarantee of provenance and had been re-corked and topped up with original material a decade back, Hill-Smith himself actually involved in the process. It was still alive with requisite structure and amazing depth of colour, although somewhat curious in bouquet and flavour, with a melange of liquorice, dark earth, herbal, treacle and briar patch. A great experience indeed. 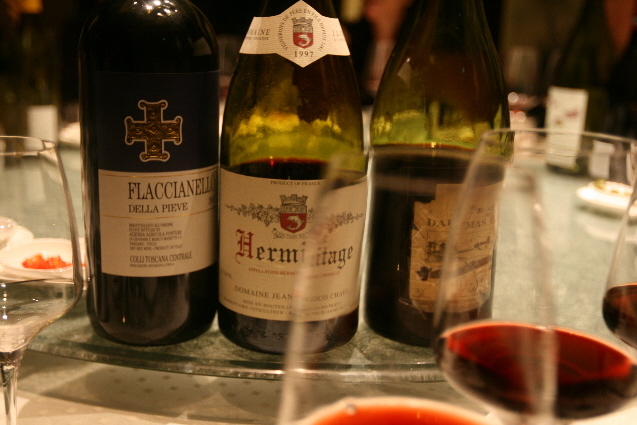 Next up were a trio of magnums reds, in order a 2001 Fontodi Flaccianello IGT, Tuscany, 1997 Chave Hermitage Rouge, Northern Rhone, and a 1990 Mas de Daumas Gassac, Languedoc-Rousillon. The 2001 Fontodi Flaccianello looked fabulous even if still brooding and decidedly youthful for 10 years in bottle/mag. This is one of my favourite wines on the planet and destined to become an Italian classic, perhaps even collectable. I certainly would rather have it in my cellar than most overrated-overpriced Bordeaux’s. Interestingly, the only Bordeaux to grace our table that evening was a Sauterne. The 1997 Chave Hermitage was enthralling, a wine already beguiling in its complexity and silky smoothness yet defined power, a veritable ‘iron fist in a velvet glove’, yet as engrossing as the wine was, it was clearly youthful and I would love to see it again at Spurrier’s 80th, 90th, and 100th! The 1990 Mas de Daumas Gassac from the Valley du Gassac was intriguing, as is the blend of 80% cabernet sauvignon with 20% rare mystery grape varieties – quite complex, earthy, and a little wild yet absolutely smooth, to the point of being perhaps a little too soft, although perhaps a hard act following the Chave. Then came the excelsior of life, a 1989 Chateau d’Yquem that whilst drinking rather nicely, looked like it would make it in to the 22nd Century. Such is the perfume of this wine; you can dab a little behind the ears as well as remain in a mesmerising trance over the bouquet. It was incredibly intense and frustratingly one of those wines you would love to drink more of, but simply can’t for sheer concentration and profoundness. And the last bottle of the night; also Lisa Perrotti-Brown’s declared wine of the night, a 1940 Yalumba Special Reserve Tawny, curiously made with the Dolcetto grape. Without sounding blasé, I was spoilt in my time as a sommelier in Australia, having the run of the best cellar in the country full of these fortified treasures, serving up countless incredible and eccentric bottles to the likes of James Halliday, Len Evans and the wine club mafia of the day. This was a great bottle though, like drinking out of an old antique cupboard with the scents of a medieval castle’s oak and stone, yet raisined and really rich and sweet, but with a powerful cut of rancio and an incredible tailing of spicy, warming spirit cuddling the senses. Monumental and momentous wine! What a night! 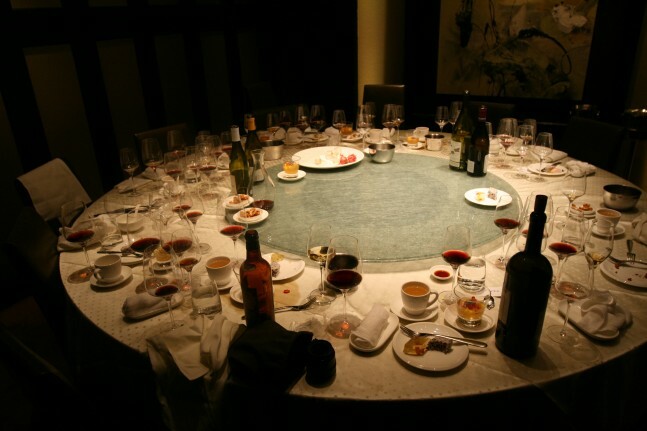 It seemed to go on forever, a never ending banquet of food and wine; a wonderful way to start Spurrier’s septuagenarian innings.